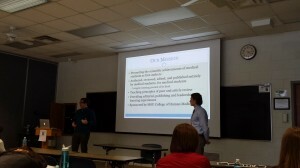 Recently, MSRJ had the unique opportunity to present at a local conference sponsored by the Asian Pacific American Medical Student Association (APAMSA). The conference was well attended by a number of students from various medical schools in the Midwest. Through this event, the journal was able to reach out to students at various stages of their medical school training and inform them of the opportunities that the journal has to offer. We are honored to receive submissions that allow students to present and showcase the hard work that they put into a research project or other manuscript. The student authors themselves receive experience navigating the submission process as first authors, and dealing directly with the editorial staff. In addition, we are thrilled for the opportunity to expand the diversity of our reviewer pool with students at other schools. Given the curiosity and interest displayed by fellow students at events like this, MSRJ is excited for the potential for expansion and advancement in the future. David Carr is a third year medical student at Michigan State University College of Human Medicine. He recieved his B.S. degree in Human Biology from Michigan State University in 2011. He is planning on pursuing post-graduate education in internal medicine in an academic setting allowing incorporation of clinical practice, teaching, and research.